And just like that, it's February. It feels like Christmas was just yesterday but Valentine's Day is almost here! Do you do anything special to celebrate? If you're in need of inspiration, I've joined with 24 talented bloggers this week to provide food, craft, and decorating ideas for this heart-filled holiday. If you've landed here from Laurie, Daniela, Cynthia or Dannyelle's place, welcome! 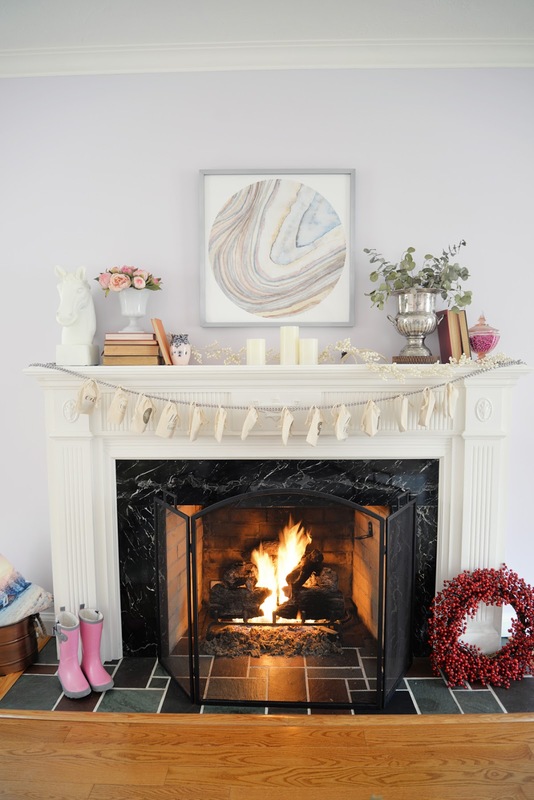 We just moved into our house a month ago so today I'm sharing a Valentine's Day Mantel and a look at our living room now that we've unpacked a few boxes. There are still so. so. so. many boxes to go, though! As far as holidays go, we celebrate Valentine's Day fairly simply. 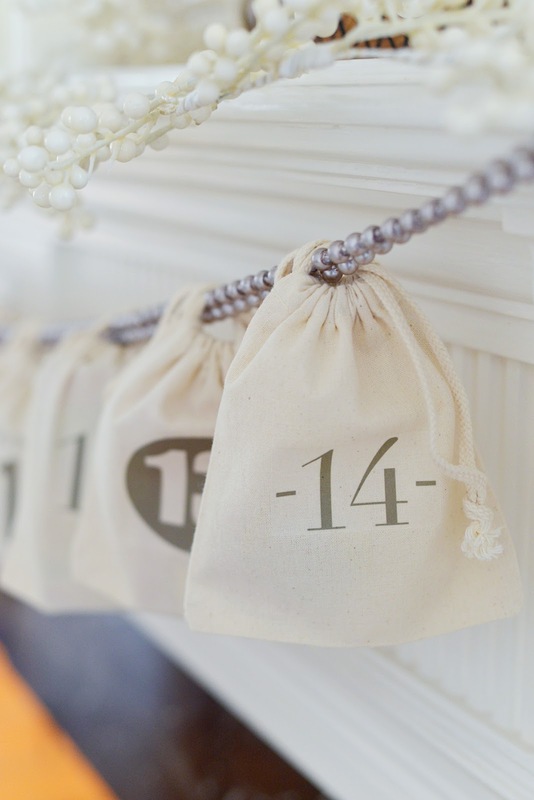 We'll go out for a nice meal, exchange cards and give little gifts and chocolate (always chocolate). 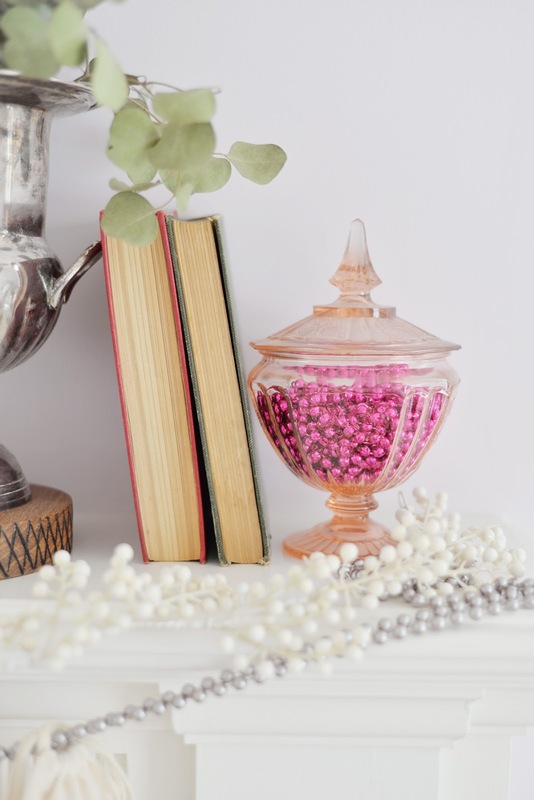 I'm not a big fan of red and pink (though my pastel-hued living room, inherited from the previous owner, might make you think otherwise) so shades of crimson don't usually find their way into my decor. 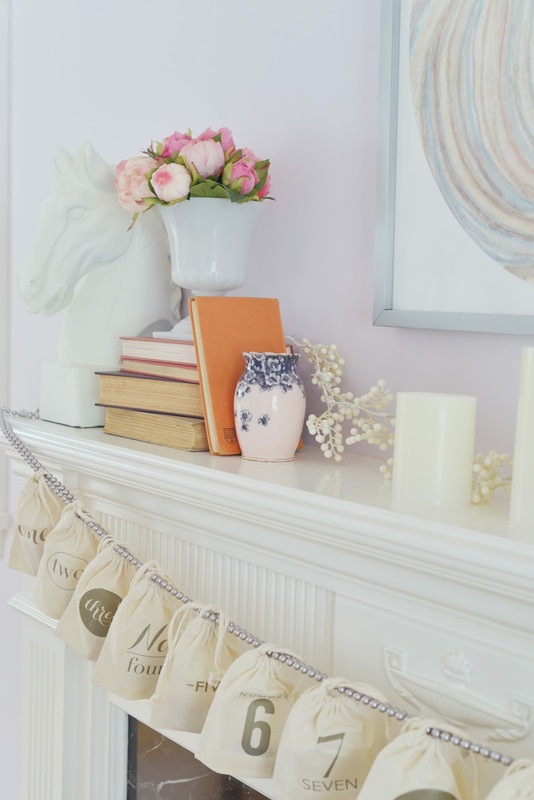 But I did want to dress up the mantel and create a display that was softly sweet and fitting for this time of year. 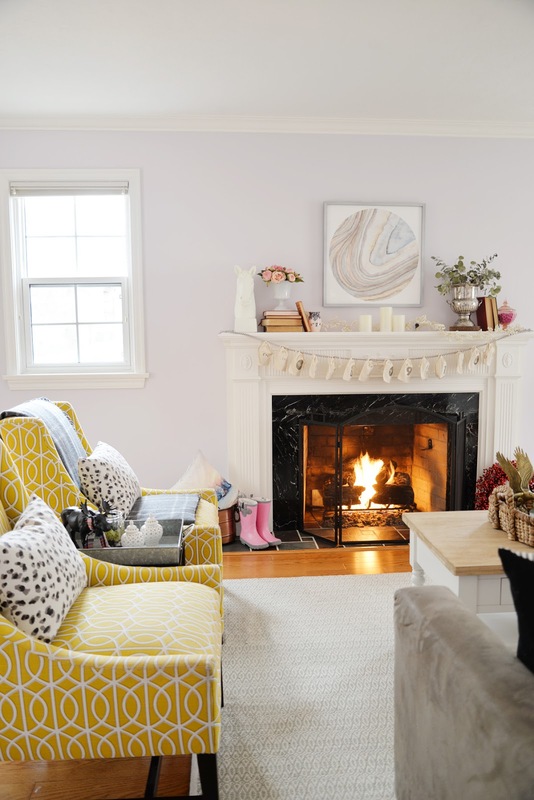 I was happy to put away the Christmas decor but I'm still craving a cozy look. 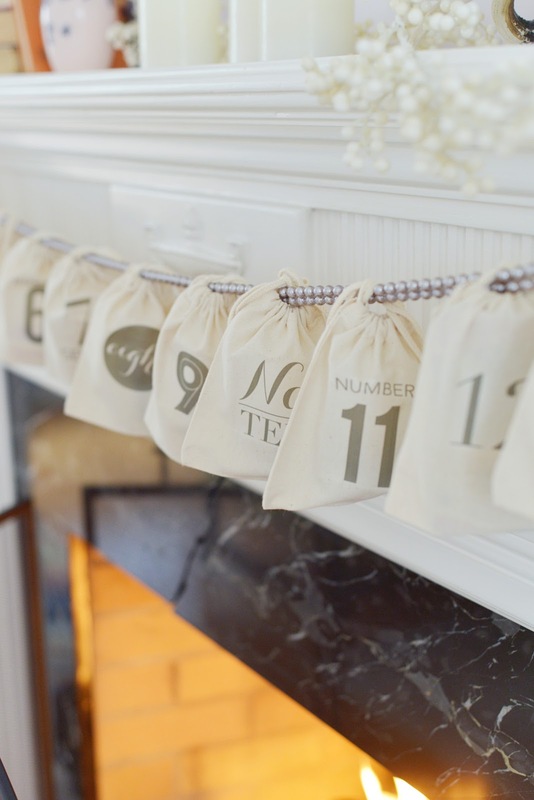 Valentine's Day decor doesn't have to be all pink hearts and cupid's arrows. 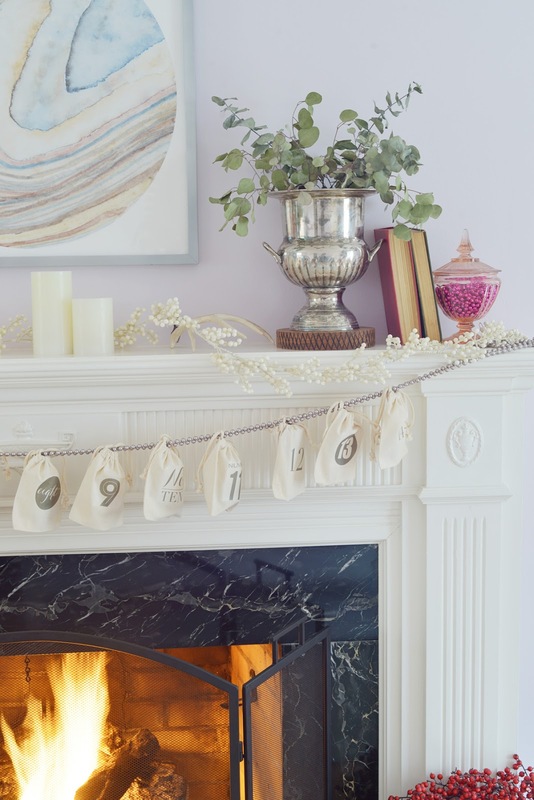 I wanted my holiday decor to be subtle and less obvious and budget friendly, so I gathered items from around the house to create a look that is romantic and imperfect. 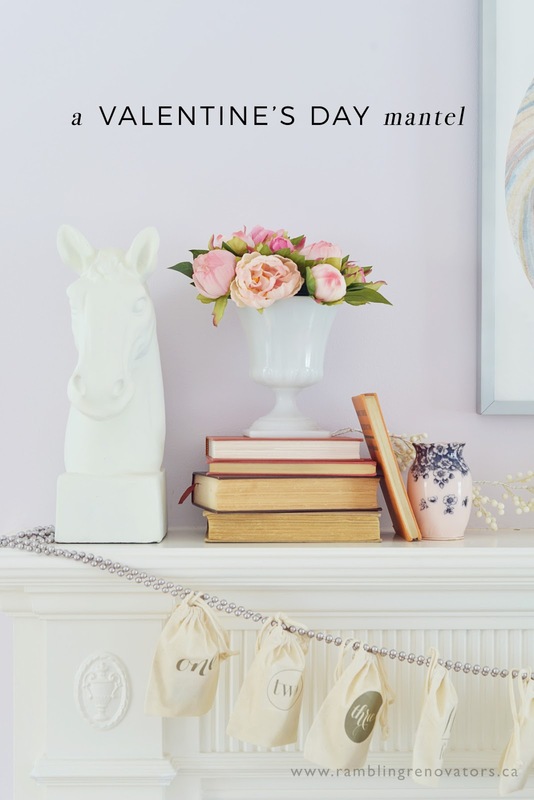 The soft hues of the Minted art set the tone. 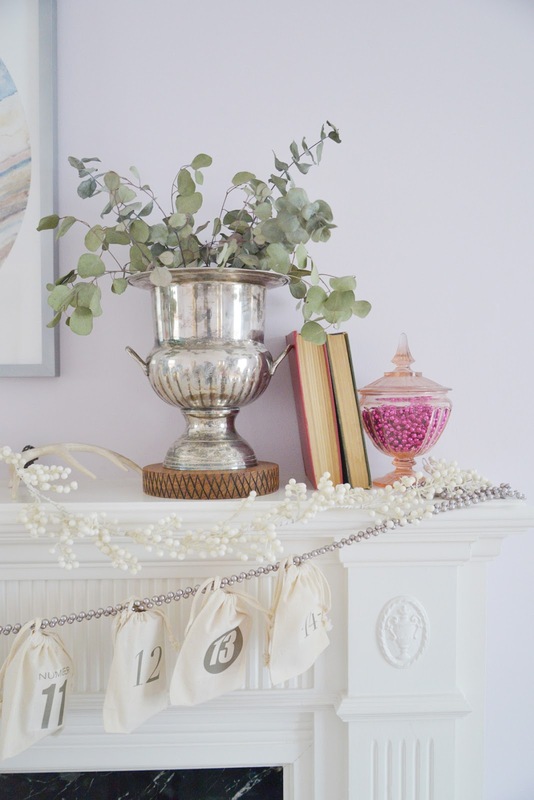 Creamy white candles, a white berry garland, and ceramics mixed with pinks in tones of pale blush to bright fuchsia. The leaves in the unpolished urn are from winter arrangements and are dry to the touch, yet they have a beautiful sculptural quality and their aubergine stalks give a hint of red so I'll keep using them until they crumble apart. 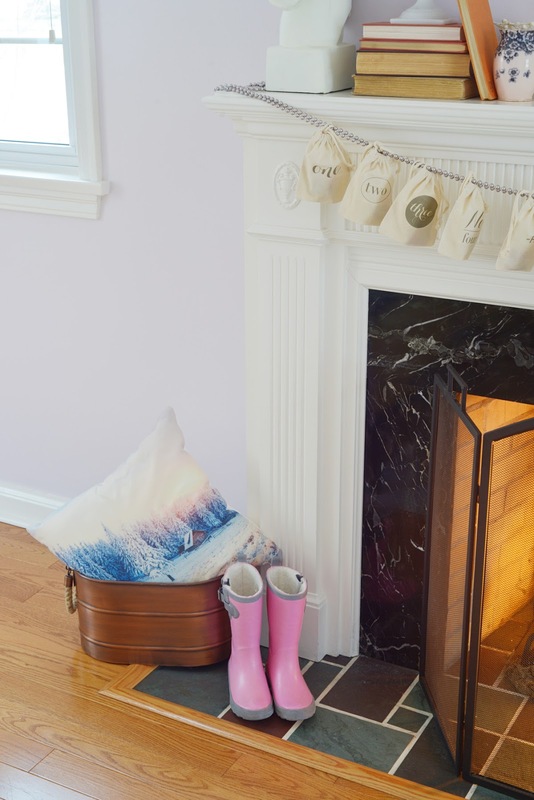 Pink rain boots and pink beads in a lidded bowl are simple ways to add rosy colour. I find that I'm much more relaxed with my decorating in this house. There's no pressure to "get it right" the first time. I know that these rooms will evolve over time and I can just enjoy how they are today. The rest of the living room is far from done. The furniture that worked in our old house doesn't quite work in this larger space, and I'm fine with that. We have grand plans for this room (as with all of our rooms). Built-in bookshelves, moulding, a new sofa and other furniture... it'll all come in time. For now, I'm moved furniture around and played with 3802 different layouts for this room. We had brought the armchair from the cottage to help fill up this end of the room. The tufted bench used to be in our old dining room. 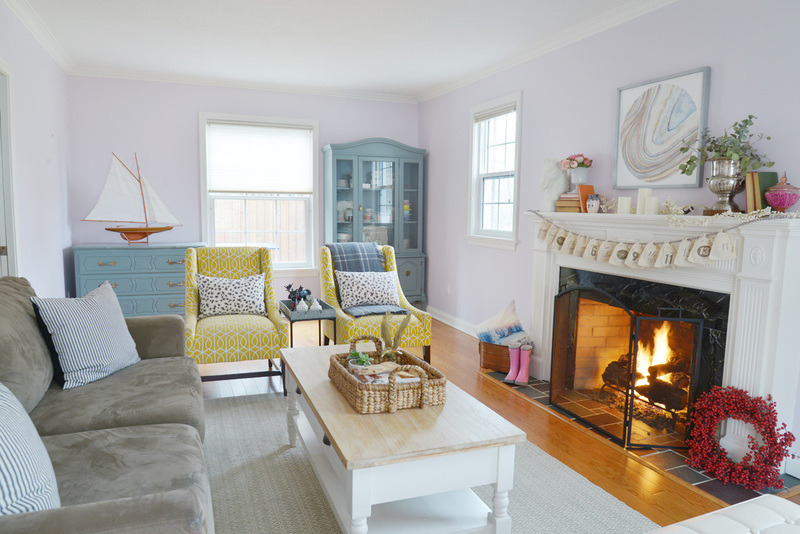 The room still feels like a mish-mash of furniture but there's bound to be settling pains as you get comfortable in a new home. The gas fireplace makes up for it though. 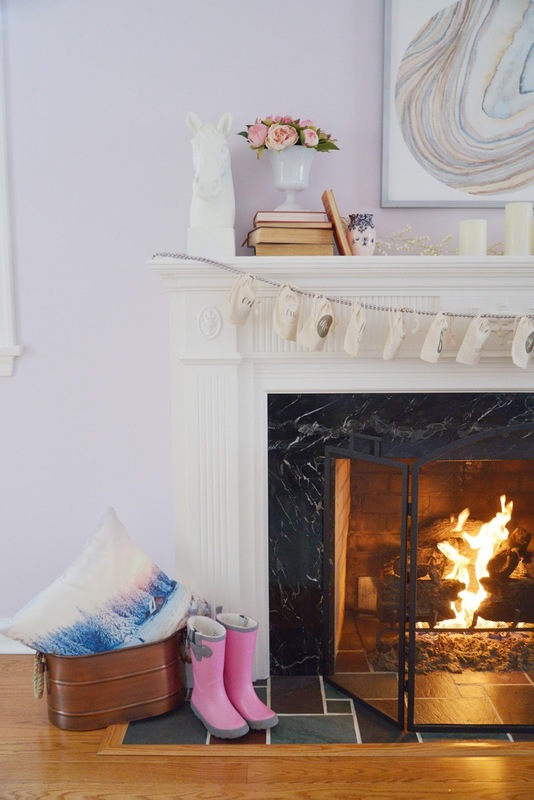 No joke, I have had that fireplace on every day since we moved in. It adds the biggest dose of romance, don't you think? I hope you enjoyed the tour. 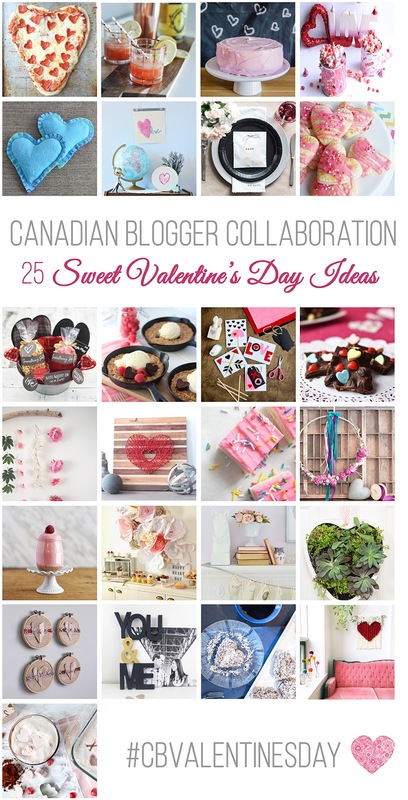 Don't forget to visit the rest of the Valentine's Blog Hop for more craft, food, and decor ideas to celebrate this day of hearts!